This year, I celebrate 15 years of my goldsmithing practice. In January of 2001, I took my first jewelry/metal Arts class, and it was love at first sight. I will honor this by celebrating a piece and story from each year. It has been such a journey, and much more to come! This is the first piece of art (to-date in 2001) I'd made which satisfied the vision I had in my head. I was raised a full-time artist mother, so I'd had years in art classes and private lessons, yet many mediums did not meet my expectations when the creation left my hands. Until... I met precious metals. My freshman year of college, I signed up for a Jewelry/Metal Arts course when realizing my path into graphic design did not seem like the right calling for me. When given our last assignment of the course- to create a piece with a 'non-metal' component, I believe they were suggesting we bezel set a stone. My instructor Mac Mccall (a big fan of alternative materials) included a quick demo on how to work with plastic, and it was a snowball effect in my little world. There were many failed attempts at cutting apart CD jewel cases, shattered prototypes, and long hours in the studio sawing away at sheets of nickel. My dorm-mates Angeline and Aaron would keep me company late-into-the night in the jewelry studio, tinkering with their already-finished projects. And the result.... was this. This was my first jewelry class, third project made in metal. When I'd day dream (go to my "happy place") I'd think of a misty wooded cliffside with a crisp and mystical feeling. I'd never found a material in which I could realize this artistic vision, until now. I was so satisfied. At 18 years old, I realized I was so blessed to find what I'd be doing for the rest of my life. Before I moved away to college, one day while my sister and I were in the yard and she picked up an African Tulip seed and said "do you know what these represent?" The little seeds- prevalent around Hawaii- have clear exterior membrane, with a little seed suspended in the center (which if you look closely, resembles a heart.) She continued "it means: keep your mind clear, and let it come from the heart"
This expression stuck with me throughout my first year in college, getting me through all the turmoil of decision-making as a new 'adult'. In the end of my second year of goldsmith training, I created this astonishing piece to represent this quote. I learn so much about fabrication when creating this piece, you can still see many components of it influence my work today: the heart, the sawing, hinged mechanisms, the narrative details. To this day, I'd call it one of my most successful pieces. Reading like a book or locket (it opens and closes, about the size of your hands when open) an open-work 'brain' is the exterior, with a venus fly-trap theme, showing how we can easily trap thoughts. Yet, when you open the brain, it reveals the heart is actually at the center of all the decision making, framed by the african tulip seeds. It took be about a month and a half to create & finish this piece- the heart is created with one continuous cut with a hand saw, in which I didn't break the single jewelers saw-blade (I deemed it the lucky sawblade). The exterior, quite the opposite, sawing a domed piece of sheet is challenging and took me... way too long. I think this is the piece in which I truly learned how to saw, and tell a story. I'd been doing a lot of research on how insects were represented in traditional jewelry, and was currently doing a series on scarabs and their status in ancient cultures. At CCA, into the third year, JMA students endure one of the most exhausting classes: a project a week for 8 weeks. This was one of the last pieces I created in that class, learning how to heat and bend plastics (which was an endeavor of my own, most the teachers had zero advice for plastics), form the delicate wings into a curve, and creating my first polished and highly wearable piece. I have made a few similar cuffs since, but I will always keep this one as a reminder of the turning point in my education. Born and raised in Hawaii, I’d grown up commonly making Haku leis while out on hikes with my family (a woven flower lei worn on the top of the head) My mother was a botanist and basket weaver, so activities like these were fairly common. These memories bring back a tradition rooted in family and cultural heritage. This piece is based on those Haku leis: a tiara crafted out of woven silver ferns. Each leaf is traced, uniquely textured, and patterned: based on a real fern I collected. There are hidden treasures and secret bits hidden all over this piece. This piece took a month to create. Making this tiara is what truly taught me how to solder. In the prior 3 years, I either had my projects successfully solder or fall apart with out me knowing why. This piece taught me all about heat control, soldering small components onto large ones, and I acknowledge this piece is why my fabrication skills are so strong to this day. In 2004 I was busy working away on my senior thesis, and I'd learned a wonderful distraction from all that stress: enameling. I was continuing my research on insects, creating jewelry pieces about the greater meaning of these little guys. I was currently dwelling on bees and wasps. How alone, they seem so small and weak, yet in swarms, they seem strong & invincible. I was digesting a lot of news about our troops in the Iraq at the time, was thinking a lot about how the noble little honey bee could easily compared to a single soldier. This piece is influenced by the designs of René Lalique created with plique-a-jour enamel (which is enamel (powdered glass) suspended in empty spaces of silver or gold.) The results are similar to stained-glass, but far more painstaking and time consuming. Contained under the hand-formed acrylic dome is a single wasp. This was the first statement piece I made post-college. I was still working through the ideas which I formed for my thesis work: Nature practices only a few tried-and-true patterns, repetitively using them in many forms of life. I'd focuses on branching patterns- how they show up in the trees, rivers, leaves, cracks in the sidewalk, veins in our hearts. We are all connected by these universal threads, a thread which I now see everywhere. In this piece I pushed my boundaries of wearability- a large tree growing out of a lichen encased heart. This necklace was created for a show hosted by the Metal Arts Guild and I still have it on display at my studio. Developing a line for the first time, I began to put together pieces would be more wearable, yet still a large statement, at a lower cost. I explored non-precious materials, resulting in a few years of work with very little silver and gold. I really enjoyed the dynamics of the cord in this necklace, the sculptural patterns it creates when being worn. Amongst working full-time for another jewelry designer, I started my first relationship with a gallery, they represented me and started carrying my jewelry, which was a huge step for me. 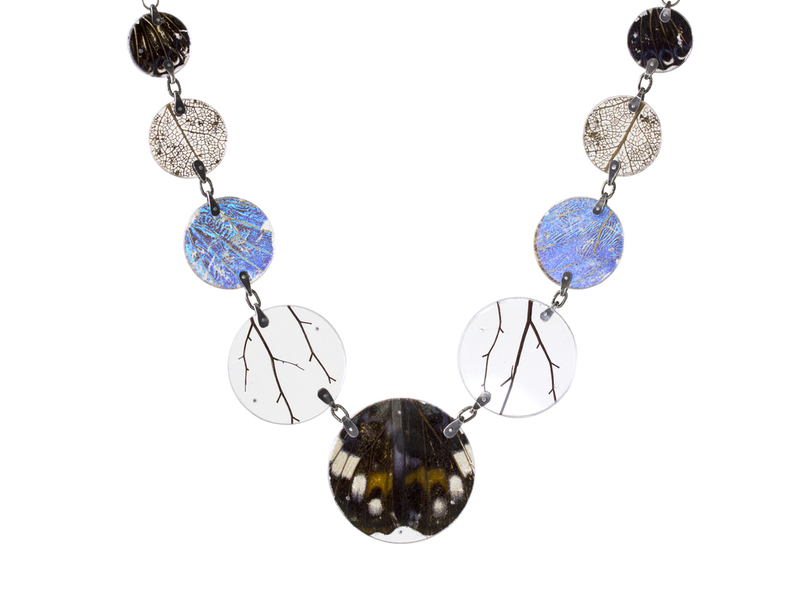 Putting together a new body of work, I returned to one of my tried-and-true themes: lyrical stories and historical references through the use of insects in my jewelry. I love the moth- an often overlooked insect, it's beauty is muted and subtle. "Like a moth to a flame" an expression we often hear, but why is the moth endlessly in love with the flame? Moths instinctively use the moon for their nocturnal navigation, finding their way through the night, and did just fine with this for centuries. Then along come humans, creating first fire, then gas lamps, electricity... we know the rest. It was the first unnatural illuminated objects, and it confuses the moth, instead of being drawn towards the moon, they are now drawn to the flame. A sweet and sad romance story. In this piece, I revisit the story of the moth and the moon, imagining it arriving at it's final destination, finding refuge at it's home for the first time. For the first time in 5 years, I'd put enough a large enough body of work to show. I was working with Vessel and Lonnie was pushing me to make wonderful pieces. I'd made an entire new body of work- very sentimental created with rose petals, anatomical hearts, and Victorian-era themes. We put together a show which around Valentine's Day and the response was astonishing: we couldn't keep pieces on the shelf very long, I was constantly scrambling to replace what had sold. It felt... wonderful. It was my first full collection since art school, and I was being urged to make very strong work by an extremely supportive gallery owner (looking back, that was an essential component). These earrings felt very complete to me: I was directly inspired by a pair of Victorian Memento Mori earrings I had seen, yet I re-arranged the sentiment to honor nature instead of a person. I began developing my ideas of WHY we wear jewelry, and our emotional drive behind those reasons. This year... many changes for me. By the end of 2009 my business was larger than ever- galleries across the nation placing orders and I couldn't keep up with my quick growth. Ready for a change, I closed up shop and moved to Ireland, gearing up to apply to grad school. Then, I got the news which would change my life forever: my mother was in the hospital and soon after diagnosed with cancer. Many flights and doctors appointments later, I dedicated the next 13 months of my life to being a full-time health-care-provider, and spent as much time as I could with my mom. My shop was closed, my tools were in storage. I wouldn't have it any other way. Yet as an artist, the drive to create is always there. Responding to a call for an exhibition, I decided to make a big piece. My friend & amazing jewelry designer @carolschwarzjewelry let me use a bench in her beautiful jungle studio. I sat there, after months of not making a thing, and just.... let it happen. The piece came out of me: layers upon layers of the messages I'd received, the techniques I'd learned, all the emotions of that year wrapped into one. It's as if, as an artist, if you do not constantly express yourself, it still manages to escape all into one piece. To this day, this is still one of my favorite pieces. It's sweet and dark essence, so much emotion inside of it, people really connect with it. This piece was purchased directly from me by a private collector a while later, and I do admit, I miss it. I will always strive to create work like this. The year following my mom's death, I kinda just let things be. My studio stayed in slumber, I took time off from life. I did a big road trip, camped, rode my bike a lot, and became a workout maniac. I was living in a little studio apartment next to my mom's bromeliad collection, and the yearning to create was always there. I started making work about my surroundings: the endemic plants and animals of Hawaii. I’m trained in many mediums: textiles, printmaking, ceramics, sculpture, darkroom photography (having an artist mom & BFA pays off! )- so, with the studio still in storage, I just chose another medium. I returned to drawing & printmaking, and created patina prints on canvas with copper and steel. It felt great to draw, but if felt even better to have my hands back on metal. This led to my decision to move my studio back home to Hawaii until the dust settled and the next steps became clear. I'd found this piece of calcified algae on the beach right after picking my mom up at the crematorium (so strange), and had this antique lense sitting around for ages. This piece came together very gracefully and naturally, and was the first piece in a long while which showed me I was back in the swing of blossoming creativity and busy hands. It was a good sign. I didn't make much work this year, I took a good 5+ months to travel around- Indonesia and Eastern & Western Europe, and throughout the states (I like to travel! This one one of my favorite trips). While I was home for a few months, I decided to revisit the moth and the moon theme. I'd started working with mirrors in my work (the surface underneath the wing is mirror) which play with the dimension and light with in the piece, and rearranges what we feel like we are looking into when we view art works. This piece is made with very lovely sphynx moth wings given to me by Mimi. People often ask me where I get my natural materials (if I kill the insects). Many of the specimens are found by me on hikes, yet a large part of my collection is fueled by my friends and collectors- special little packages & hand delivered items arrive all year round- strange little insects, lichens, snakeskin, sweet treasures which will someday find a larger platform to stand on. I had this idea in my mind for a long time... it's what love looks like in my mind's eye. When two people's hearts become so intertwined, they are connected into one. I want to revisit the idea of WHY we wear jewelry, to create work which will return us to romanticism, wearing pieces which signify love, dedication and sentiment. Wanting to capture the essence of created in the piece from 2010- I embarked on this large statement piece. This was one of the first large pieces I created in my new studio in SF. I'd closed up shop in Hawaii, wanting to returning back to the Bay Area to grow my business and be surrounded by motivated, inspiring & ambitious colleges. I returned to the heart of it all, setting up my shop right in downtown San Francisco. Coming full circle, I revisited a few themes with these earrings and brought so much more to the table. Four layers of hand-sawed coral-themed patterns, domed into perfect crescents to create light, wearable statement earrings in oxidized sterling silver exterior, with glowing 18k interiors. I see these as my current direction in my mind's eye: creating glowing work with depth, dimension, and high wearability. In my years of making jewelry, I worked hard to make my jewelry highly wearable and easily functionable. Often the first reaction when I hand someone a pair of earrings is: 'oh, they are so light! : My lessons are sometimes subtle to the eye- working with thinner materials with a delication hand, to create feather-light graceful pieces. These are true pieces of art, and their platform is the body. This pair of earrings sold shortly after I finished them. This year in my life & business I'm pushing myself to do more traveling shows and trade shows than ever before. It's a lot of work, growth, and a great way to finish new pieces and flush out old ideas. For a few years I've been dreaming up a full wrap-around encasement necklace. It's so fun to pull out all of my special natural materials, mix-and-match different colors and textures, to see how they interact with each other. I've started a whole new series of these and am excited too see what is to come. This one is called Midnight Flight and includes butterfly, maidens hair, morpho wings and citrus leaf. Reminiscing about the places I've been over the last 15 years has been so interesting, it's fascinating to see how life is so integrated with the creative process. It has been a pleasure to tell these stories behind the jewelry, each piece is enriched with rich inspiration and emotion. so many thank you for reading and coming along for the ride!